Oh, hey. It's me. Happy weekend! I'm coming atcha today with a super simple, it's too-hot-to-turn-on-the-oven kind of homemade snack. Because if you're anything like me, snacking is one of your favorite hobbies. It is a verb, after all. And maybe reaching for something sweet — like chocolate chips — is what you gravitate towards. If so, we can be friends. A few weeks ago, my husband bought a Costco-sized bag of Nestlé chocolate chips (because, Costco), and he's only been enjoying a handful or so when he feels like it. And that's it. So thanks to his impressive self-control, we still have plenty of the bag to go. YAY. However, I figured I should start putting the chocolate chips to even better use. While there are zero things wrong with eating them straight out of the bag, that's not exactly my forte. Brownies, cookies, and chocolate chip ice cream on the other hand? SIGN ME UP. Anyway, it was a balmy 97 degrees in Denver on Thursday, so I wasn’t exactly in the mood to turn on my oven. I was also pressed for time. I scoured Pinterest, and no-bake cookie dough bites showed up. Inspiration, done. For context, I knew we'd need portable snacks this weekend. Because by the time you’re reading this, we'll be in Idaho! Specifically, in a (super) small, picturesque mountain town. Our close friends are getting married and it's going to be unforgettable. We can't wait. But knowing my husband and I, we're going to get hungry during our travels. Enter: airplane and car ride snacks. When traveling, I love anything that's easy to eat (read: doesn’t spill everywhere), tastes good, and fills me up. These are just that. Enjoy! 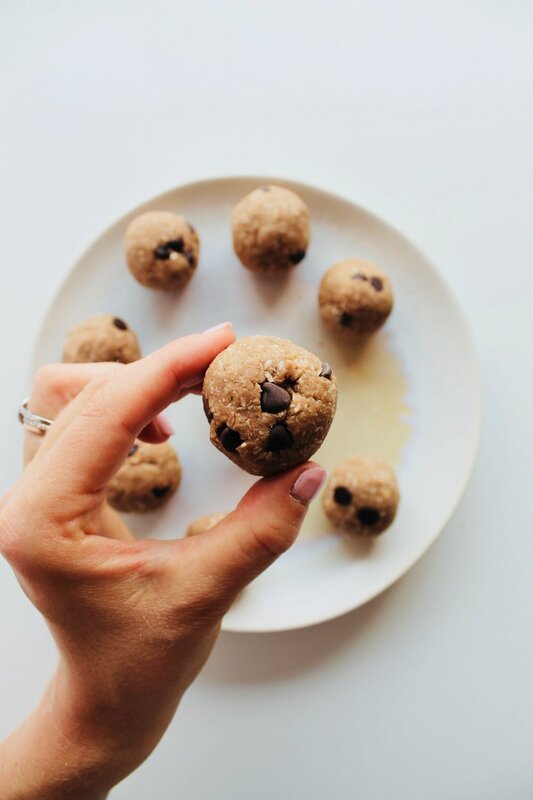 Portable, protein-packed snack bites are great to have in the car, at your desk, while hiking, or whenever hunger strikes. They're chewy, chocolate-y, and versatile. Feel free to use whatever protein powder you have on hand (or omit entirely). 1. In a food processor, add the cashews, dates, and coconut oil. Pulse until it's reached a creamy consistency (1-2 minutes). Scrape down the sides if necessary. 2. Add in the rest of the ingredients, except the water and choco chips. Pulse. 3. Slowly, add in the water. The mixture should form into a ball. If it is too dry, slowly add in 1-2 tbsp of warm water. Gentle fold in the chocolate. 4. Scoop out spoonfuls of the dough and roll into balls. Place in the fridge, covered, for at least 30 minutes. Dig in! 5. These will last for up to two weeks in the fridge, but they can also be eaten at room temperature for up to a week.